GSMArena team, 5 December 2016. The Oppo R9s runs ColorOS 3.0 - technically Android 6.0 Marshmallow, but it's so heavily customized so it doesn't follow closely the feature set of the Google-developed operating system. Units sold outside of China come with the full Google suite, which means some doubled functionality across apps provided by Oppo and Google. The R9s software is not what we would call a "lean installation," instead it comes pre-loaded with social networking apps, a document editor and more. Even Chrome is not alone; an Opera-powered Browser app is the default web browser out of the box. In total, the user has access to just under 53GB of the 64GB of built-in storage. The user interface is the familiar mash-up of Android and iOS. There's no app drawer on the default launcher. Instead, every app you install gets dumped on the homescreen. That's fine most of the time until you start installing apps you rarely use or install apps just for their widgets. Then you may want a junk folder to drop off all the app shortcuts you don't need. The Lockscreen features an ever-changing slideshow of images. You can subscribe to several different channels (e.g. photos of nature or cars or others) or provide your own imagery. The set of photos will be updated periodically, but only over a Wi-Fi connection, so it doesn't cost you mobile data. We have nothing but good things to say about the fingerprint reader on the Oppo R9s - it's very accurate and blink-and-you'll-miss-it fast. 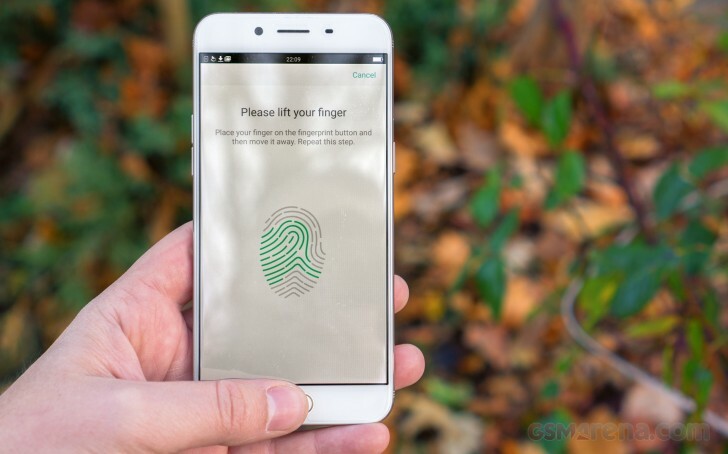 It can secure more than the lockscreen - the phone can also encrypt individual files and even whole apps and make them accessible only with the right fingerprint (or a Pattern lock as a fallback). The wallpaper on the homescreen doesn't change as the lockscreen wallpaper does, but you can still spruce up the place with Themes. The Theme Store features whole themes and just wallpapers, sorted into categories (including free and paid ones). Themes change the icon pack, the lockscreen wallpaper and some even change the clock on the lockscreen (but do not bring similar widgets to the homescreen). Oppo futzed around with the notification area. When you pull it down, you always see the toggles first. If you want the notifications, you have to swipe right to get to them. We would have much preferred to have the notifications as the default view or at least have options for an alt-pull - either two-finger pull or pulling from the left/right side of the screen. The Settings screen is modeled after the iOS settings screen, and we're not huge fans of it. In standard Android, an app's settings are accessible from the app itself, in ColorOS that's not always the case. For example, changing the settings of the dialer app requires going into the Settings screen and finding Call. This just feels like extra hassle for no benefit. We do like the Screen-off gestures, though. They are simple commands done on a black screen - O to start the camera, V for the flashlight, several symbols to control the music player and a few custom options. Simple Mode is available, which distils the homescreen to the most basic features - one screen of contacts and one screen of apps. With 4GB of RAM the Oppo R9s glides through the interface. The Snapdragon 625 chipset has enough oomph to switch between apps without breaking a sweat, but we're about to see how it handles more arduous tasks.